MailPoet integration for weForms gives you the experience of using the best WordPress Newsletter plugin with the best Form Builder. 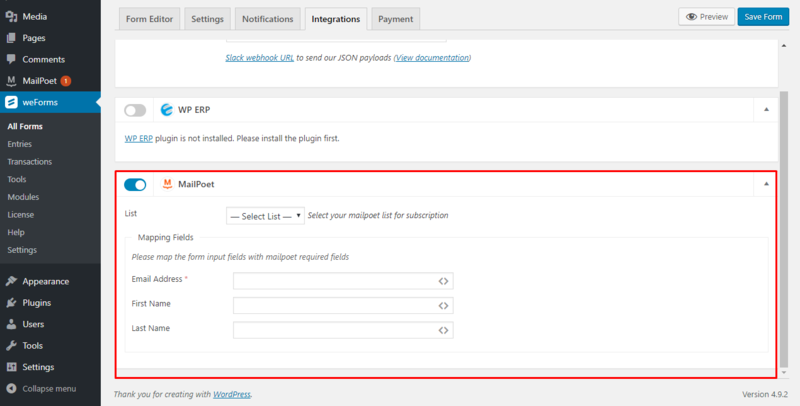 Import your subscriber list from weForms to MailPoet with simple synchronization. Unlimited forms with weForms meaning unlimited subscribers list. Create intuitive and interactive forms to increase subscribers and follow up using MailPoet. Schedule your emails to your subscriber gathered from weForms. Ability to send emails from your own website to leads collected using weForms. Improve service using MailPoet’s bounce mangement system. Use the fastest contact form builder and the best Newsletter plugin for WordPress to create awesome emails.